This whole Moto X+1 saga is quite interesting. Word of this mysterious device/promo/who-knows-what-it-really-is arrived through leakster @evleaks, along with word of new leather backs, but has since made another appearance on Motorola’s MotoMaker site for all to see. While we don’t have a ton of info to add to this far-from-finished story, we have seen new references on Motorola’s own site through a cached page to the four colors of leather that were previously outed. We have also seen mentions of carriers and found the image you are seeing above with the name “Moto X+1” and a direct reference to AT&T. From what we have seen, the Moto X+1 will indeed have black, blue, grey, and red leather options. Actually, it’s pretty obvious that this Moto X+1 product will indeed be available through MotoMaker, as it has been attached to all current Moto X options, including front plates, back plates, storage sizes, accents, cases, and of course, carriers. Speaking of carriers, we are seeing references to Verizon, Sprint, and AT&T. 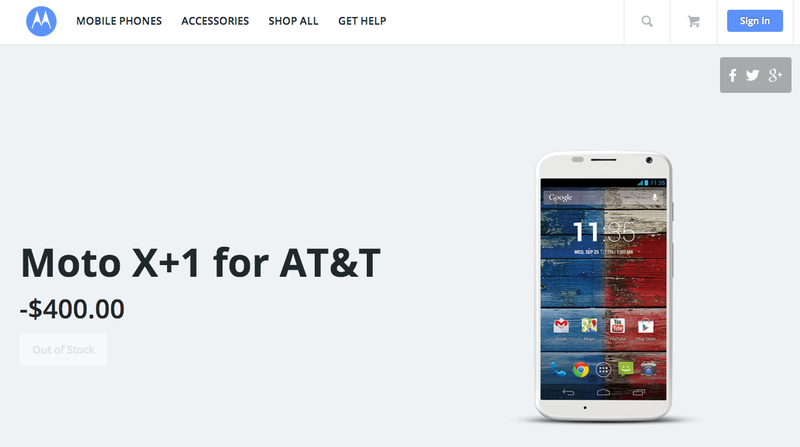 Again, as you can see from the header image above, a page has already been built for the AT&T Moto X+1. Keep in mind that this is simply a place-holder page, and that is not the actual product or price. Seeing those three carriers shouldn’t surprise you, though, since those are the same three major carriers attached to the Moto X. Remember that T-Mobile passed on the Moto X for the most part and instead left control of an unlocked model that worked on T-Mobile’s network up to Motorola to handle. For all we know, we could see a similar situation with this device. I think the take away here should be that whatever the Moto X+1 is, it will be very similar to the original Moto X. You will have MotoMaker access, which means you will be able to customize the device with new options like leather. Motorola told us to expect the new Moto X in late summer. If the Moto X+1 is the new Moto X, Motorola has clearly started getting things ready ahead of time. Or maybe Motorola is trolling us by leaving pages like this up and live.